Throughout much of the 1930s, the Worcester Art Museum joined three others in excavating Antioch, one of the four great cities of the late Roman Empire. First a mobilization point for Roman military campaigns against the Parthians, it had prospered under Julius Caesar and Augustus and grown into a cultural and political center, flourishing until an earthquake devastated the city in A.D. 526. Among the greatest treasures unearthed at Antioch were numerous mosaics from public and private buildings. 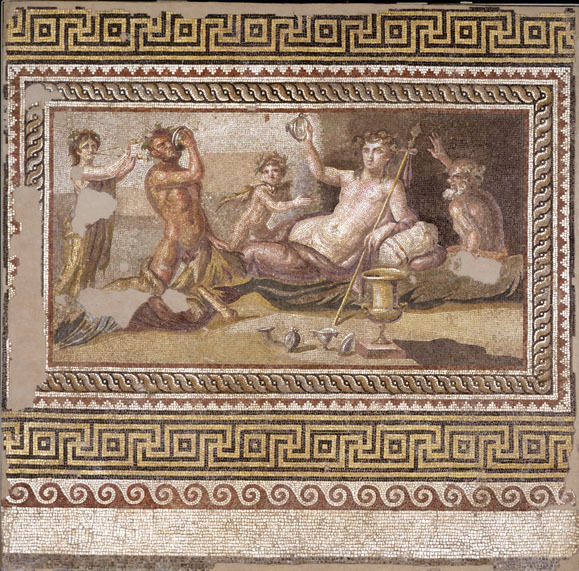 This pavement, reflecting the realistic space of late Hellenistic painting, was one of five that decorated the floor of a triclinium, or dining room, of an elegant villa from the first Roman period of the city. 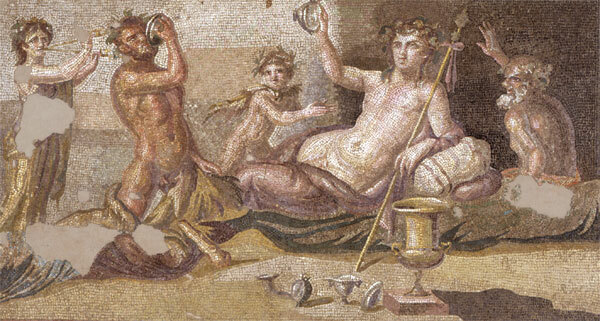 Fittingly, it depicts a mythical symposium, or drinking contest, with Dionysos, the god of wine, reclining at the center. Crowned with vine leaves in his luxuriant curls, the pale god displays the empty cup that he has drunk dry. A ruddy Heracles is on his knees, challenging Dionysos. Silenus, on one side, and Ampelus (a child personifying the vine), on the other, give the victory to the god, while a slave girl at the left plays the double flute.